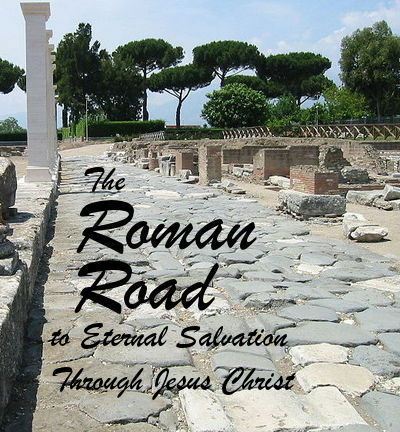 The Roman Road: Eternal Salvation through Jesus Christ can be yours! WHAT IS THE ROMAN ROAD TO SALVATION? The Roman Road to Salvation is also magnificent, but its destination is completely different: an eternity in Heaven through the believe on the Lord Jesus Christ as your only way to heaven. Romans Road lays out the plan of salvation through a series of Bible verses from the book of Romans. When arranged in order, these verses form an easy, systematic way of explaining the message of salvation. The Roman Road is simple–and easy to travel. 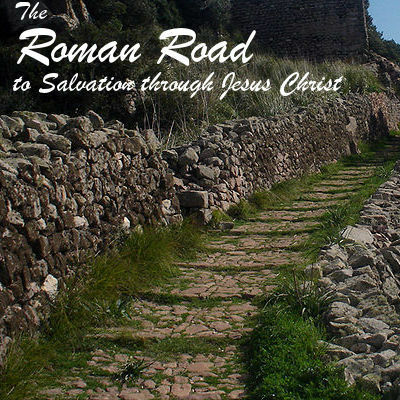 “The Roman’s Road” is popular method of presenting the Gospel using only Scriptures from the Biblical Book of Romans. It is certainly an effective soulwinning tool which every believer should be well familiarized with. 2. The penalty for sin. “Death” in this case means eternal spiritual death; confinement to hell. 3. God loves you and has made a Way to escape the penalty for sin. 4. What must we do we do to be saved? 5. Confess and believe on the name of Jesus Christ. 7, DO NOT FORGET THE GOSPEL! The gospel of Jesus Christ is the power of God unto eternal salvation. (See the gospel at the end of this article). To celebrate, here’s a free printable bookmark to help you remember the Roman Road–so you can tell others! Belief and salvation are only the first steps. We’re commanded as believers to witness and share the good news of the gospel of Jesus Christ with a lost and dying world. Some denominations believe that baptism is a requirement for salvation. This is a point of dispute. In any case, it’s important to be baptized. A believer should be baptized as soon as possible after salvation. Reading the Bible helps believers grow in faith. This is extremely important. God speaks to his children through His Word. Prayer is talking with God. Believers are not to memorize and recite prayers. Talking with God is one of the most important things believers can do to keep their faith strong. New believers are encouraged, exhorted and edified when they assemble with others believers in our Lord Jesus Christ. 5. Witness: Tell others of what Jesus has done for you. Leave a comment and let us know if you have any questions or need more information.